The UX Design Shop at Dreamforce 2014 provided a real-world example of how "Internet of Things" technologies could provide an engaging and immersive retail experience. Salesforce1, Heroku, Analytics Cloud and ExactTarget were all working together for the first time ever to create this unique IoT experience. This was a pet project I initiated out of my love for connected devices. I pitched my original concept to design and development leadership to get buy in. Soon I found myself with the support of likeminded designers and developers and the rest is the results you see below. Each visitor to the UX Shop had a custom generated brand mark based on their initials and a randomized Salesforce product family color. Using personnel armed with Android tablets to sign up participants we began their user journey. 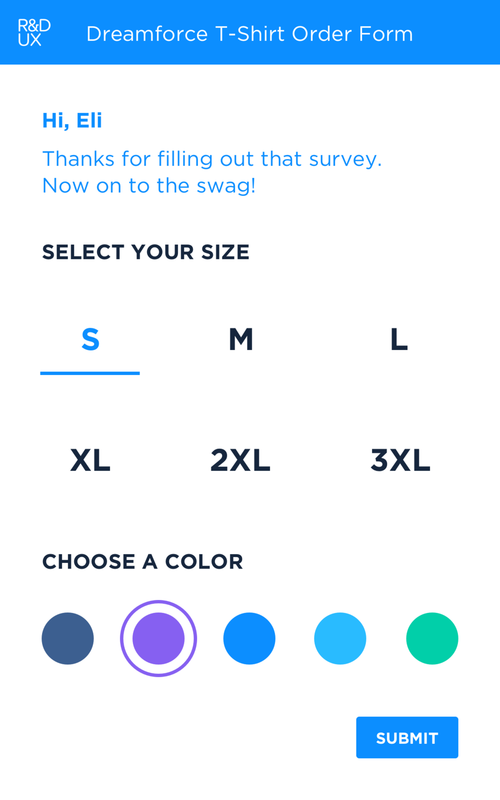 This allowed customers to select their t-shirt color and size prior to arriving at the experience. 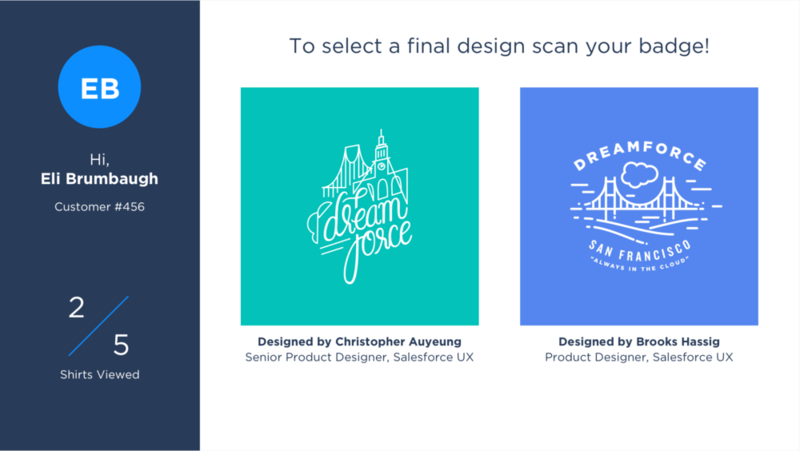 At the end of the journey when their badge is scanned they see a customized visual confirmation of their selection, the name of the designer and a special thanks from Salesforce UX. The Customer is prompted to swipe their badge to check in. 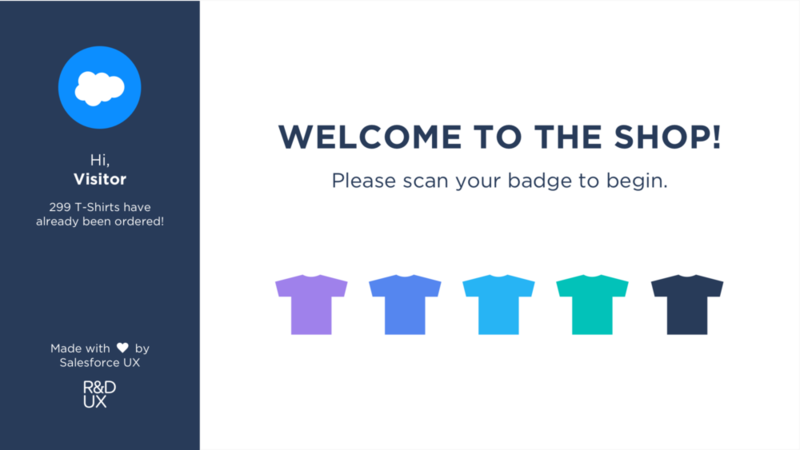 Once checked-in the system instantly knows their shirt size and has instantly applied their unique brand mark to the experience. 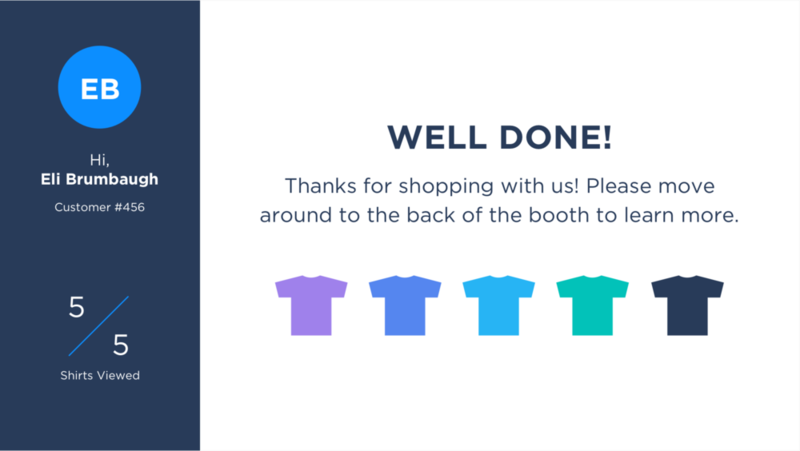 The Customer is then prompted to interact with the connected objects that represent the different shirt designs they can choose from. As they pick up different representational shirts the screen displays the design or designs they are currently holding. Once the Customer decides which shirt they swipe their badge to send the order to the shirt printers.